Dinesh D’Souza’s book smearing George Soros is factually false, morally reprehensible, and nothing new. As he hawks his most recent book, The Big Lie—ironically, a near-perfect description of its contents, which claim to reveal the Nazi roots of the American left—D’Souza has tweeted countless versions of this particular big lie. With childish faux cleverness, he refers to Soros as “Hitler’s collection boy” and claims that Soros “literally worked for Hitler.” Right-wing talk-radio shows, websites, and even a Republican gubernatorial candidate from Pennsylvania have parroted lines from his anti-Soros campaign. Anti-Semitism has become a key element in exciting the passions of ‘populist’ conservatives here and abroad. The Soros slander appears to derive from a bizarre 60 Minutes interview conducted by Steve Kroft nearly 20 years ago. In his introduction, Kroft intoned: “While hundreds of thousands of Jews were being shipped off to the death camps, George Soros accompanied his phony godfather on his appointed rounds, confiscating property from the Jews.” The accompanying footage showed masses of Hungarian Jews being led away at gunpoint as Kroft spoke. Then he turned to Soros accusingly: “My understanding is you went out with this protector of yours, who swore you were his adopted godson…went out, in fact, and helped in the confiscation of property from Jews.” Clearly flummoxed by the moral and intellectual imbecility of the inquiry, Soros offered a stumbling response that failed to clarify the truth. Soros is a critic of Israeli policies, so the government that claims to represent the Jewish people excused an anti-Semitic campaign against him. Aware of Hungary’s history in the Holocaust and the fears of its remaining Jewish community, the Israeli ambassador, Yossi Amrani, complained to Prime Minister Viktor Orbán: “The campaign not only evokes sad memories but also sows hatred and fear…. It’s our moral responsibility to raise a voice and call on the relevant authorities to exert their power and put an end to this cycle.” Incredibly, Amrani’s own government implicitly rebuked him by having his statement “clarified.” Israeli Prime Minister Benjamin Netanyahu had a visit to Hungary scheduled, and he shares with Orbán—and, of course, with Donald Trump—a commitment to xenophobic fearmongering as a means of shunting aside accusations of corruption, dishonesty, and dysfunction. The Israeli Foreign Ministry immediately issued a statement accusing Soros of “continuously undermining Israel’s democratically elected governments” by funding organizations “that defame the Jewish state and seek to deny it the right to defend itself.” Thus, because Soros is a critic of Israeli policies, the government that claims to represent the Jewish people excused an anti-Semitic campaign against a Holocaust refugee conducted by the leader of a nation that participated in the Holocaust. Let that one sink in for a minute. 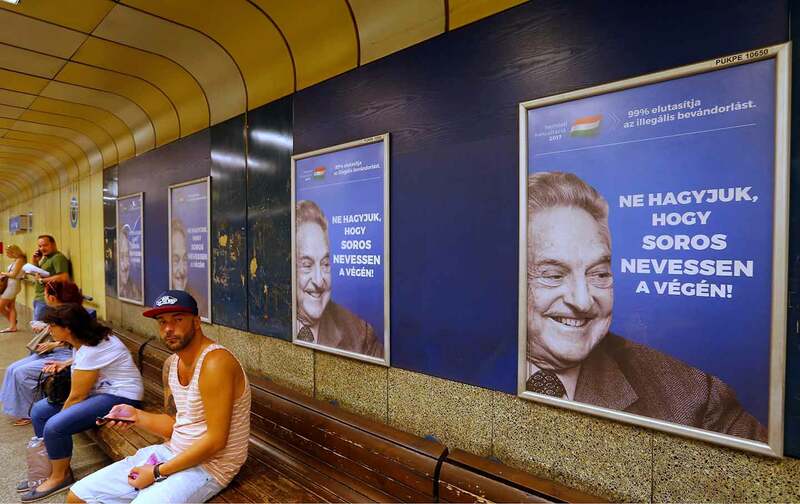 As with almost everything in American politics today, the charges against Soros are not really about Soros, much less what a 14-year-old boy did on one day during the German occupation of Hungary. D’Souza thinks that “former Nazi collaborator George Soros should be investigated as a sponsor of domestic terrorism” for his alleged sponsorship of antifa. Neither Soros nor his foundations support antifa in any way, but never mind that: At last count, more than 138,000 idiots had signed a petition at whitehouse.gov demanding that President Trump “declare George Soros a terrorist and seize all of his related organizations’ assets under RICO and NDAA law.” Incredibly, this is where our politics has taken us in 2017, a time when the murderous madness that seized so much of Europe in the 1930s and ’40s appears to be repeating itself—farcically, perhaps, but dangerously nevertheless.